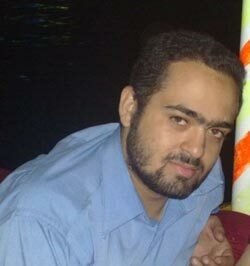 Blogger Mohammad Adel who runs the blog Maeit (already dead! )disappeared since Friday, November 21, 2008. As reported by Wael Abbas on Twitter, Adel was supposedly going to meet with an American journalist for an interview, but the he did not show up. On His blog, Adel's Friend published post reporting that Egyptian State Security Forces stormed into the house of blogger Mohamed Adel on Friday predawn, searched the house, and seized many of his books and CDs. Good to note that Mohammad is a Muslim Brotherhood member, and his web page is full of banners, calling for freedom to Brotherhood detainees. Besides, he used to update his readers with news about Gaza. In his statements to Ikhwanweb, Adel Fahmi reported the disappearance of his son expecting that he was arrested on fabricated charges.State security also broke into Mohamed’s house a month ago due to his participating in the Anti-Gaza Siege Campaign. Today, a protest to the disappearance of Adel was held in front of the Genral Prosecutor Office, by some young political activist, with the attendance of the missing blogger's father. Adel Fahmi, said he is proud of his son, and called for his immediate release. The editor of Meit blog, was arrested twice before, once on the year 2006, during a protest seeking more independency to the judiciary , and the second time was last May, while some cyber activists were calling for a general strike. Egyptian blogspher knew the news through Jakiu mobile network, and reacted immediately. Zeinobia and 3arabawy blogs (English speaking) published post about the matter, later on many other bloggers and Facebook users wrote notes telling their friends about the disappearance of Adel. Blogger Mohamed Khairi is still in custody despite he received a release warrant few days ago. The Egyptian blogger who writes on “Jarr Shakal” blog (teasing) has been arrested at the dawn of the 17th of this November from his house in Fayoum governate in Nile Delta. 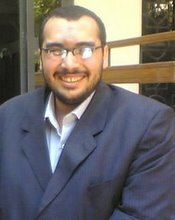 Khairy is a student in the faculty of engineering in Cairo University, and he was previously arrested. Mohamed Khairi was first arrested last October 22 because of his participation in the people's campaign to lift the siege on Gaza Strip, but he was released after the decision of Fayoum Prosecution to imprison him for 15 days. He has been arrested twice in less than a month. In the last time the investigators of State Security have asked Khairy to close his blog and he was threatened to be rearrested if he did not implement what is required from him, also his Laptop was confiscated during his past arrested and was not returned to him. Pingback: Internet Sans Frontières » Blog Archive » La blogosphère égyptienne retient son souffle?